Work-In-Process - The Making of "Over"
C. Rasmussen, Over, 2015. 24"x30", oil on canvas. This is part of my She Was Just a Dream series, which is about memory, loss and the things we leave behind. In "Over," I wonder: how did the garment get there? Which way was the person who discarded it going over the fence? Is the viewer looking back at something they left behind, or witnessing someone else's strands of memory? Here are some photos of the work-in-progress; the "behind-the-scenes," if you will. 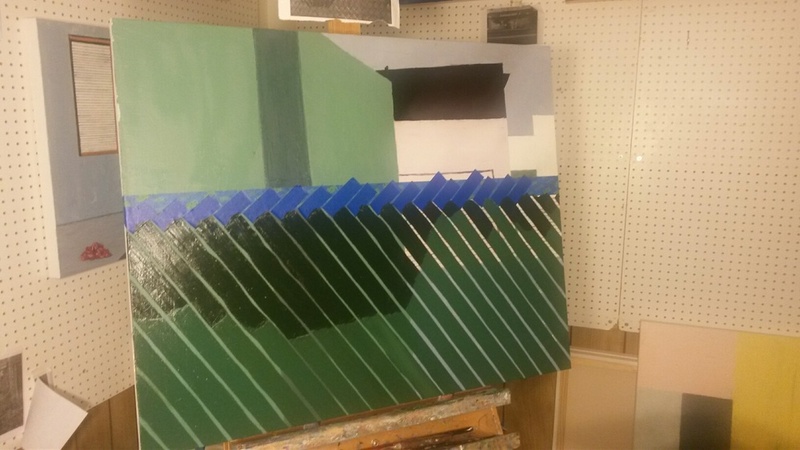 Starting with blocking in the main shapes, I created the fence lines with some tape (the blue stuff). Adding some details on the shipping container (left-hand, lighter green shade). Typically, dark colors recede so you don't put them in the foreground, but since I wanted this view of the dark green fence in the foreground, I had to add a lot of layers to it to make it bolder and bring it forward. Adding details...in this case, lots of lines. This is a slightly larger painting than I've been working on recently, so I didn't realize when I began what a commitment that fence would be. I had to do 3 passes on the metal - one for the primary shape, then one for the shadow and one for the highlight. The process alternated between being meditative and monotonous, but I got through it by listening to some exciting audio books! Namely, Tana French's Dublin Murder Squad series. I really enjoyed adding the barbed wire at the top of the fence. Barbed wire holds a special place in my visual memory...but that's a story for another day.